Laticrete International were the company who really invented the modern day adhesive, going back over 60 years to 1956. Their founder, Dr. Henry M. Rothberg, was the first chemist to incorporate a latex polymer with a crete filler. As time went on and trends changed, the demand for a single part polymer modified powder to the same consistency and performance was required – and so Laticrete’s a one-step polymer fortified thin-set mortar was born. It has been used on some of the worlds most demanding projects and has performed impeccably. 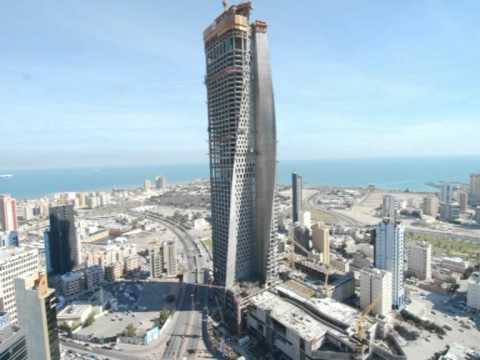 The New York architects SOM (Skidmore, Owings & Merrill - one of the worlds largest and most prestigious practices) specified Laticrete for The Alhamra Tower in Kuwait City, at 412.5 metres, the world’s highest exterior clad building. The height and location of the building combined with the extreme weather conditions (temperatures of up to 50 degrees) produced extreme thermal expansion, concrete shrinkage, and exceptional wind loading. Technology and testing from NASA was used to calculate wind and weather conditions and to specify the adhesive mortar and grout with the necessary physical properties. Laticrete provided the adhesive, grout and grout enhancer. “We selected this product for many reasons, one being its high shear-bond strength and balanced shear modulus properties,” said Goldberg. Being an American-formulated product, Laticrete has been tested intensively to meet the high quality demands of the US market. Also, owing to the potential of litigation on failure at every turn in this and similar markets, products have been through the most rigorous tests from the ASTM (American Standards) and TCA (Tile Council of North America). It has also been tested to ISO (International Standard Organisation) and European Norms EN an has achieved the GEV Emission Standard Emicode EC1+. We are proud to partner Laticrete, the world's most advanced and highly specified natural stone cladding adhesive. The ultimate one-step, polymer fortified, thin-set mortar for interior and exterior installation of ceramic tile, stone, quarry tile, pavers and brick and is designed to just mix with water, has a long open time with unsurpassed initial grab, high shear, tensile and flexural strength along with excellent workability. We have developed an exclusive, comprehensive MVIS system which Laticrete will warranty. Our long relationship has led to us being able to offer a unique warranty to give you complete peace of mind. Tried and tested over fifty years of Oslo winters, this premium product ensures that once our stone cladding is fixed it stays fixed! We can supply our exclusive Laticrete MVIS with our stone cladding products as part of a one-stop service. "Regarding Laticrete - I have tested their MVIS in conjunction with our fibre cement tile backing products and found its bond to be considerably stronger than that of regular high quality tile adhesives. It is the only adhesive that we are comfortable with at this time for bonding Norstone to our boards."